Some kids go to Cancun, but this college student spent 41 hours at Wal-Mart: Spring break at Wal-Mart. Skyler Bartels kept looking over his shoulder. 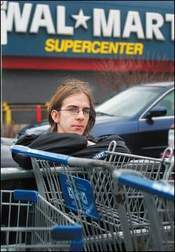 It's a habit he picked up living at the Windsor Heights Wal-Mart for three days. Really living there. Eating, sleeping, checking out the DVDs, never leaving. The plan was to spend his entire spring break there. Under the radar. What did the Wal-Mart suits think about it? "We weren't aware of this," said corporate spokeswoman Sharon Weber, "but it's not something we condone. We're a retailer, not a hotel."